Lebanon's cabinet has approved a bill to amend the constitution and allow the president, Emile Lahoud, to stay in power for another three years. Mr Lahoud's six year term comes to an end in November, and the current constitution forbids presidents from serving two consecutive terms. The cabinet meeting follows a flurry of visits by Lebanese politicians to Syria, Lebanon's political master. Thousands of Syrian troops are stationed in Lebanon. The US, Britain, France, Germany and numerous Lebanese politicians and clerics had all voiced their opposition to an extension of the president's mandate. By calling on Lebanon to stand by its constitution, the international community was also sending a message to Syria to stop interfering in Lebanon's affairs. The cabinet session was headed by Prime Minister Rafiq Hariri who had been initially opposed to the amendment but who appears to have been convinced by Syria to go along with it. Mr Hariri met Syrian president Bashar al-Assad in Damascus on Thursday. Mr Lahoud is Syria's closest ally in Lebanon. The cabinet session was attended by Mr Lahoud, as well as by all 30 ministers who make up the government. Three voiced their opposition to the bill. The extraordinary cabinet meeting was called in a hurry overnight - a sign that Syria is keen to get the constitutional amendment approved before opposition to the move inside and outside Lebanon becomes too important. On Friday, White House spokesperson Scott McClellan called on Syria not to interfere in the Lebanese elections. But the US comments have been criticised by Syria's allies here as interference in Lebanese affairs. The Lebanese parliament is now expected to convene in an extraordinary session next week to vote on the cabinet proposal. 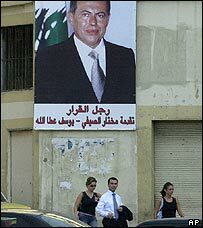 And Syria's influence in Lebanon means it can probably count on the needed two-thirds majority in parliament to ensure that Mr Lahoud will stay in office until the year 2007.